On the 25th of April 2015, Nepal suffered an earthquake measuring 7.8. Because of my continuous involvement in disaster relief projects around the world over the last 20 years, I received requests for support from both people I know and people whom I have never met. This time the number of messages that I received was especially large. I was contacted by Nepalese students in Tokyo, photographers, mountain climbers, tourists, investors, and NGOs to name a few. My interest towards Nepal—a country somewhat unfamiliar to me—grew and soon after I began to prepare for disaster relief activities. In order to gather more information, I arranged a meeting with Nepalese graduates from the engineering department of the Tribuhan University living in Tokyo. As always, I contacted the local Nepalese university to become the recipient of the aid material sent from Japan and to arrange a workshop with the students upon our arrival in Nepal. The engineering department head of Tribuhan University, Professor Tri Ratna Bajracharya kindly accepted my request. Up to date I have developed several types of emergency shelters using paper tubes as structural elements. 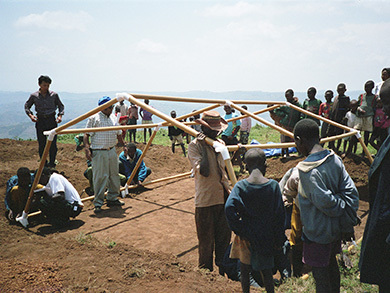 For UNHCR’s project in Rwanda in 2004, I designed a paper tubing structure using plastic connectors (Fig. 1). After the 2010 earthquake in Haiti, I developed paper tube structures using plywood connectors (Fig.2). However, while ready-made paper tubes are cheap and easy to find in any country, plastic and plywood connectors are time consuming to manufacture. Consequently, in the case of Nepal, I chose to use duct tape (Fig.3) to secure paper tube joints for the first time. The first prototype was assembled in Japan and refabricated in Nepal using locally produced paper tubes and duct tape joints (Fig.4, 5). After the workshop, 500 people gathered for a lecture mainly focusing on disaster relief projects. Following the lecture, detailed and practical questions from the audience were discussed (Fig.6). In addition to the above mentioned activities, I have made arrangements to send 130 used tents donated by TSP Taiyo Inc.—a company we collaborated with on a temporary housing project using shipping containers in Onagawa, Japan. Through our clients, we requested support from Thai Airways, Singapore Airlines, and Cathay Pacific to transport the tents and travel to Nepal. Since these tents are normally used for outdoor events and only provide roofing, we asked Japanese general contractors through OCAJI—The Overseas Construction Association of Japan, Inc.—to donate sheets to be used as walls for the tents (Fig.7). 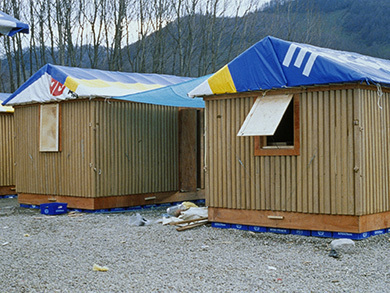 Collaboration with OCAJI on disaster relief projects commenced after the 1999 earthquake in Turkey (Fig.8), and due to this previous partnership, the donors have generously agreed to donate the tents for relief work in Nepal. During our visit to Nepal, we made preparations to assemble paper tube shelters as a short-term project with student volunteers. We had meetings with local architects and companies who could coordinate the construction of temporary houses, and held discussions with the Japanese embassy. We also visited the outskirts of Kathmandu to see the disaster affected villages. In the process, we researched local materials, markets and traditional building techniques. We were also able to find out the problems unique to the local sites. Most of the collapsed buildings had a wall thickness of approximately 50cm (Fig.9)that were made of simple structure by making layers of sundried and baked bricks. Even the people whose houses were not totally collapsed feared to live in brick-made houses after the traumatic earthquake experience and preferred to live in tents. The community appealed to me, expressing that they never want to live in a masonry house. One of the biggest problems at the disaster site however, is how to dispose of the rubbled bricks accumulated in the wreckage (Fig.10). While looking at the traditional Nepalese houses that were not collapsed, I noticed the presence of carved wooden frames embedded within the brick walls (Fig.11). After studying traditional Nepalese architecture, I went to a timber market in the suburbs. Besides milling lumber, market workers were constructing window and door frames using simple tools (Fig.12). In that moment, an idea presented itself to me. 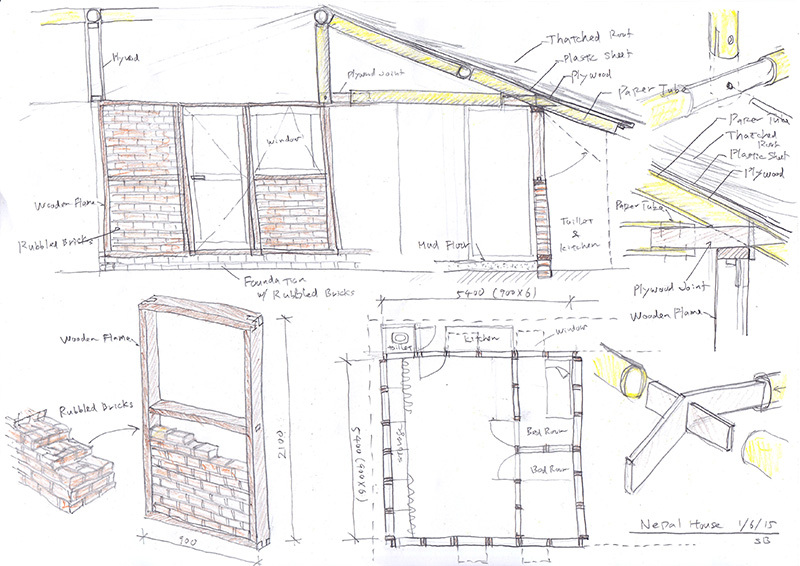 Drawing inspiration from the traditional window frames and the abandoned piles of rubbled brick, a construction method came together in my mind: a wall system that can be assembled by connecting modular wooden frames (3ft x 7ft or 90cm x 210cm) and infilling with rubbled bricks (Fig.13). This simple construction method enables anyone to assemble the wooden frames very quickly and if a roof (a truss made of local paper tubes) is secured on top, and the wooden structure covered with a plastic sheet, people can immediately begin to inhabit the shelters. Afterwards, people can stack the rubbled bricks inside the wooden frames and slowly complete the construction themselves. I plan to build an experimental structure and test how much force the wooden frames can bear. The structural integrity of this temporary house lies primarily in the wooden framing, and although the walls are to be infilled with rubbled bricks, the masonry itself functions as a secondary structural system. In the case of a two-story building, one can add a plywood panel inside the wooden frame for structural strength. 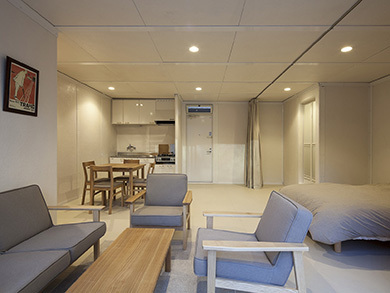 For a longer term housing project in Nepal, I have begun to talk with both Japanese and overseas investors to develop low-cost prefabricated housing, which has already begun in the Philippines. 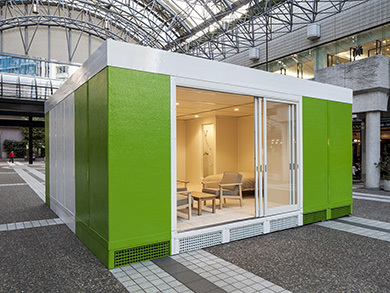 This project commenced after the 2011 earthquake in Japan when the lack of supply in temporary housing became apparent. In order to avoid such a shortage during future disasters, I designed a low-cost prefabricated house that can be manufactured in developing countries such as the Philippines and India, and assembled in disaster struck zones, if the need arises. 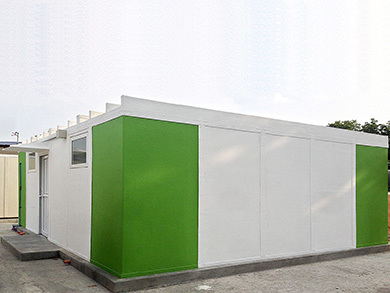 The structure of these prefabricated homes consists of wall assemblies using fiber reinforced plastic and foam board sandwich panels (Figs.14-16). This project not only creates better quality temporary housing rapidly, but also creates local employment through factories for these houses in developing countries. Furthermore, this system serves to improve the housing conditions of low-income groups in developing nations. A prototype house has already been made and assembled at the factory in the Philippines (Fig.17). Business offers from India and Nepal have been made to build such factories.